The Atlys circuit board is a complete, ready-to-use digital circuit development platform based on a Xilinx Spartan-6 LX45 FPGA, speed grade -3. The large FPGA and on-board collection of high-end peripherals including Gbit Ethernet, HDMI Video, 128MByte 16-bit DDR2 memory, and USB and audio ports make the Atlys board an ideal host for a wide range of digital systems, including embedded processor designs based on Xilinx’s MicroBlaze. Atlys is compatible with all Xilinx CAD tools, including ChipScope, EDK, and the free ISE WebPack™, so designs can be completed at no extra cost. 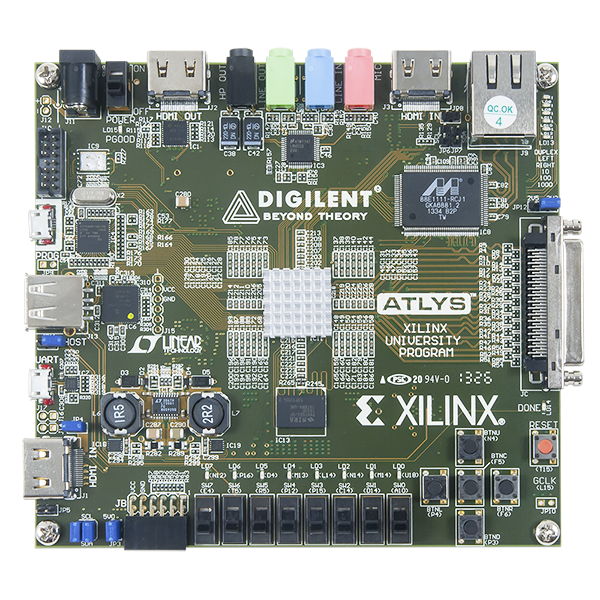 The Atlys board includes Digilent's newest Adept USB2 system, which offers device programming, real-time power supply monitoring, automated board tests, virtual I/O, and simplified user-data transfer facilities. A comprehensive collection of board support IP and reference designs, and a large collection of add-on boards are available on the Digilent website. See the Atlys page at www.digilentinc.com for more information. After power-on, the FPGA on the Atlys board must be configured (or programmed) before it can perform any functions. The FPGA can be configured in three ways: a USB-connected PC can configure the board using the JTAG port any time power is on, a configuration file stored in the SPI Flash ROM can be automatically transferred to the FPGA at power-on, or a programming file can be transferred from a USB memory stick attached to the USB HID port. An on-board mode jumper (JP11) selects between JTAG/USB and ROM programming modes. If JP11 is not loaded, the FPGA will automatically configure itself from the ROM. If JP11 is loaded, the FPGA will remain idle after power-on until configured from the JTAG or Serial programming port. Always keep JP12 loaded (either on 3.3V or 2.5V). If JP12 is not loaded, bank 2 of the FPGA is not supplied, and neither are the pull-ups for CCLK, DONE, PROGRAM_B and INIT_B. The FPGA is held in the Reset state, so it is not seen in the JTAG chain, neither can be programmed from the serial FLASH. 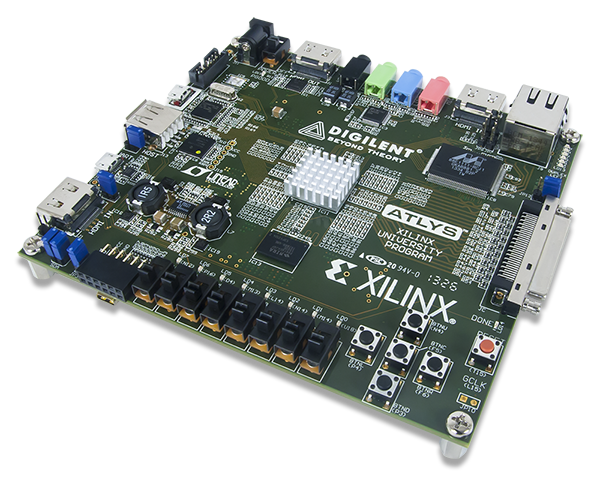 Both Digilent and Xilinx freely distribute software that can be used to program the FPGA and the SPI ROM. Programming files are stored within the FPGA in SRAM-based memory cells. This data defines the FPGA’s logic functions and circuit connections, and it remains valid until it is erased by removing power or asserting the PROG_B input, or until it is overwritten by a new configuration file. FPGA configuration files transferred via the JTAG port use the .bin or .svf file types, files transferred from a USB stick use the .bit file type, and SPI programming files use the .bit, .bin, or .mcs file types. Xilinx’s ISE WebPack and EDK software can create .bit, .svf, .bin, or .mcs files from VHDL, Verilog, or schematic-based source files (EDK is used for MicroBlaze™ embedded processor-based designs). Digilent's Adept software and Xilinx's iMPACT software can be used to program the FPGA or ROM using the Adept USB port. During FPGA programming, a .bit or .svf file is transferred from the PC directly to the FPGA using the USB-JTAG port. When programming the ROM, a .bit, .bin, or .mcs file is transferred to the ROM in a two-step process. First, the FPGA is programmed with a circuit that can program the SPI ROM, and then data is transferred to the ROM via the FPGA circuit (this complexity is hidden and a simple “program ROM” interface is shown). After the ROM has been programmed, it can automatically configure the FPGA at a subsequent power-on or reset event if the JP11 jumper is unloaded. A programming file stored in the SPI ROM will remain until it is overwritten, regardless of power-cycle events. The FPGA can be programmed from a memory stick attached to the USB-HID port if the stick contains a single .bit configuration file in the root directory, JP11 is loaded, and board power is cycled. The FPGA will automatically reject any .bit files that are not built for the proper FPGA. Adept has a simplified programming interface and many additional features as described in the following sections. 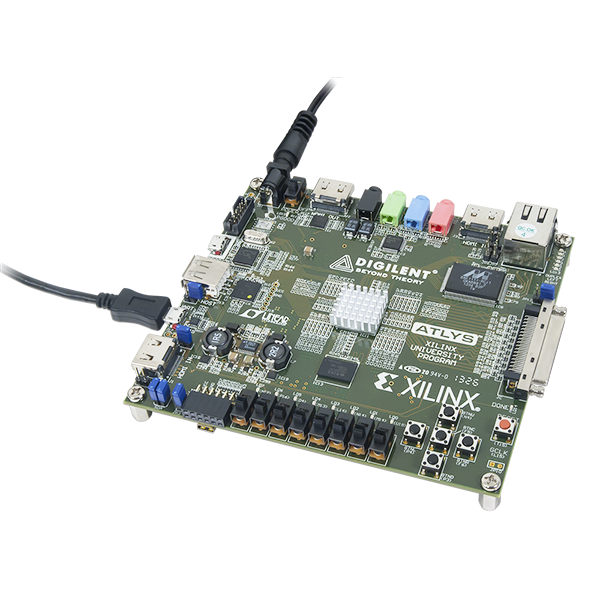 The Adept port is compatible with Xilinx's iMPACT programming software if the Digilent Plug-In for Xilinx Tools is installed on the host PC (download it free from the Digilent website’s software section). The plug-in automatically translates iMPACT-generated JTAG commands into formats compatible with the Digilent USB port, providing a seamless programming experience without leaving the Xilinx tool environment. Once the plug-in is installed, the “third party” programming option can be selected from the iMPACT tools menu, and iMPACT will work as if a Xilinx programming cable were being used. All Xilinx tools (iMPACT, ChipScope, EDK, etc.) can work with the plug-in, and they can be used in conjunction with Adept tools (like the power supply monitor). Adept’s high-speed USB2 system can be used to program the FPGA and ROM, run automated board tests, monitor the four main board power supplies, add PC-based virtual I/O devices (like buttons, switches, and LEDs) to FPGA designs, and exchange register-based and file-based data with the FPGA. Adept automatically recognizes the Atlys board and presents a graphical interface with tabs for each of these applications. Adept also includes public APIs/DLLs so that users can write applications to exchange data with the Atlys board at up to 38Mbytes/sec. The Adept application, an SDK, and reference materials are freely downloadable from the Digilent website. wait for the FPGA to be recognized. Use the browse function to associate the desired .bit file with the FPGA, and click on the Program button. The configuration file will be sent to the FPGA, and a dialog box will indicate whether programming was successful. The configuration “done” LED will light after the FPGA has been successfully configured. Before starting the programming sequence, Adept ensures that any selected configuration file contains the correct FPGA ID code – this prevents incorrect .bit files from being sent to the FPGA. In addition to the navigation bar and browse and program buttons, the Config interface provides an Initialize Chain button, console window, and status bar. The Initialize Chain button is useful if USB communications with the board have been interrupted. The console window displays current status, and the status bar shows real-time progress when downloading a configuration file. The Flash programming application allows .bin, .bit, and .mcs configuration files to be transferred to the on-board SPI Flash ROM for FPGA programming, and allows user data files to be transferred to/from the Flash at user-specified addresses. The configuration tool supports programming from any valid ROM file produced by the Xilinx tools. After programming, board power must be cycled to program the FPGA from the SPI Flash. If programming with a .bit file, the startup clock must be set to CCLK. The Read/Write tools allow data to be exchanged between files on the host PC and specified address ranges in Flash. The test interface provides an easy way to verify many of the board's hardware circuits and interfaces. These are divided into two major categories: on-board memory (DDR2 and Flash) and peripherals. In both cases, the FPGA is configured with test and PC-communication circuits, overwriting any FPGA configuration that may have been present. Clicking the Run RAM/Flash Test button will perform a walking ‘1’ test on the DDR2 memory and verify the IDCODE in the SPI Flash. Clicking the Start Peripherals Test button will initialize GPIO and user I/O testing. Once the indicator near the Start Peripherals Test button turns green, all peripheral tests can be run. The Test Shorts feature checks all discrete I/O’s for shorts to Vdd, GND, and neighboring I/O pins. The switches and buttons graphics show the current states of those devices on the Atlys board. Each button press will drive a tone out of the LINE-OUT or HP-OUT audio connectors. The power application provides highly-accurate (better than 1%) real-time current and power readings from four on-board power-supply monitors. The monitors are based on Linear Technology’s LTC2481C sigma-delta analog-to-digital converters that return 16-bit samples for each channel. Real-time current and power data is displayed in tabular form and updated continuously when the power meter is active (or started). Historical data is available using the Show Graph feature, which shows a graph with current data for all four power supplies for up to ten minutes. Recorded values are also stored in a buffer that can be saved to a file for later analysis. Save Buffer and Clear Buffer are used to save and clear the historical data in the buffer. The register I/O tab requires that a corresponding IP block, available in the Parallel Interface reference design (DpimRef.vhd) on the Adept page of the Digilent website, is included and active in the FPGA. This IP block provides an EPP-style interface, where an 8-bit address selects a register, and data read and write buttons transfer data to and from the selected address. Addresses entered into the address field must match the physical address included in the FPGA IP block. Register I/O provides an easy way to move small amounts of data into and out of specific registers in a given design. This feature greatly simplifies passing control parameters into a design, or reading low-frequency status information out of a design. The File I/O tab can transfer files between the PC and the Atlys FPGA. A number of bytes (specified by the Length value) can be streamed into a specified register address from a file or out of a specified register address into a file. During upload and download, the file start location can be specified in terms of bytes. As with the Register I/O tab, File I/O also requires specific IP to be available in the FPGA. This IP can include a memory controller for writing files into the on-board DDR2 and Flash memories. The I/O Expand tab works with an IP block in the FPGA to provide additional simple I/O beyond the physical devices found on the Atlys board. Virtual I/O devices include a 24-LED light bar, 16 slide switches, 16 push buttons, 8 discrete LEDs, a 32-bit register that can be sent to the FPGA, and a 32-bit register that can be read from the FPGA. The IP block, available in the Adept I/O Expansion reference design (AdeptIOExpansion.zip) on the Adept page of the Digilent website, provides a simple interface with well-defined signals. This IP block can easily be included in, and accessed from, user-defined circuits. For more information, see the Adept documentation available at the Digilent website. The Atlys board requires an external 5V, 4A or greater power source with a coax center-positive 2.1mm internal-diameter plug (a suitable supply is provided as a part of the Atlys kit). Voltage regulator circuits from Linear Technology create the required 3.3V, 2.5V, 1.8V, 1.0V, and 0.9V supplies from the main 5V supply. The table below provides additional information (typical currents depend strongly on FGPA configuration, and the values provided are typical of medium-size/speed designs). The four main voltage rails on the Atlys board use Linear Technology LTC2481 Delta-Sigma 16-bit ADC's to continuously measure supply current. Accurate to within 1%, these measured values can be viewed on a PC using the power meter that is a part of the Adept software. Atlys power supplies are enabled by a logic-level switch (SW8). A power-good LED (LD15), driven by the wired-OR of all the power-good outputs on the supplies, indicates that all supplies are operating within 10% of nominal. A load switch (the FDC6330 at IC17) passes the input voltage VU to the Vswt node whenever the power switch (SW8) is enabled. Vswt is assumed to be 5V, and is used by many systems on the board including the HDMI ports, I2C bus, and USB host. Vswt is also available at expansion connectors, so that any connected boards can be turned off along with the Atlys board. A single 1Gbit DDR2 memory chip is driven from the memory controller block in the Spartan-6 FGPA. Previous versions of the Atlys were loaded with a Micron MT47H64M16-25E DDR2 component, however, newly manufactured Atlys boards now carry an MIRA P3R1GE3EGF G8E DDR2 component. The datasheet for the MIRA device can be found be performing an internet search for P3R1GE3JGF, which is an equivalent part. Both of these chips provide a 16-bit data bus and 64M locations and have been tested for DDR2 operation at up to an 800MHz data rate. The DDR2 interface follows the pinout and routing guidelines specified in the Xilinx Memory Interface Generator (MIG) User Guide. The interface supports SSTL18 signaling, and all address, data, clocks, and control signals are delay-matched and impedance-controlled. Address and control signals are terminated through 47-ohm resistors to a 0.9V VTT, and data signals use the On-Die-Termination (ODT) feature of the DDR2 chip. Two well-matched DDR2 clock signal pairs are provided so the DDR can be driven with low-skew clocks from the FPGA. When generating a MIG core for the MIRA part, selecting the “EDE1116AXXX-8E” device will result in the correct timing parameters being set. When generating a component for the Micron part, it can be selected by name within the wizard. The part loaded on your Atlys can be determined by examining the print on the DDR2 component (IC13). 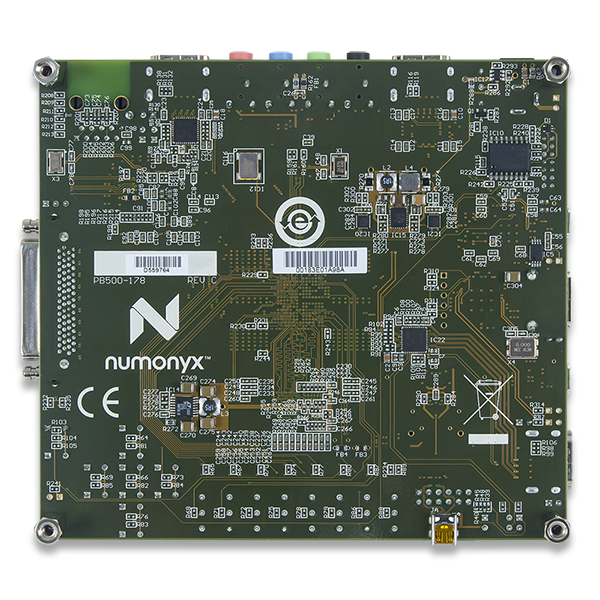 The Atlys board uses a128Mbit Numonyx N25Q12 Serial Flash memory device (organized as 16-bit by 16Mbytes) for non-volatile storage of FPGA configuration files. The SPI Flash can be programmed with a .bit, .bin., or .mcs file using the Adept software. An FPGA configuration file requires less than 12Mbits, leaving 116Mbits available for user data. Data can be transferred from a PC to/from the Flash by user applications, or by facilities built into the Adept software. User designs programmed into the FPGA can also transfer data to and from the ROM. A reference design on the Digilent website provides an example of driving the Flash memory from an FPGA-based design. A board test/demonstration program is loaded into the SPI Flash during manufacturing. 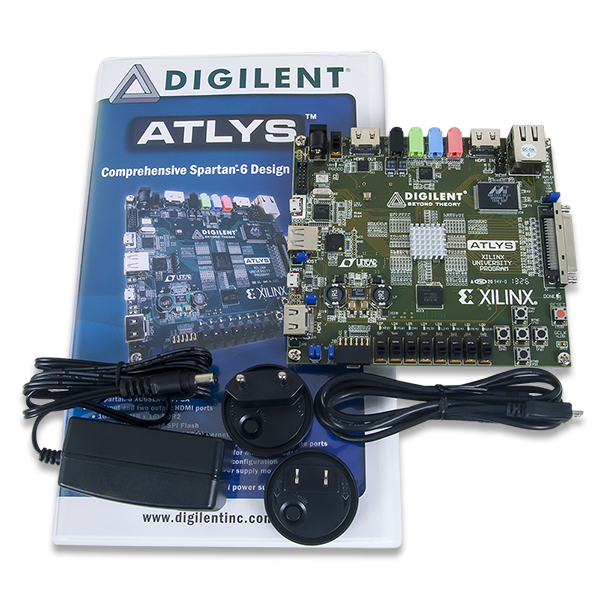 That configuration, also available on the Digilent webpage, can be used to demonstrate and check all of the devices and circuits on the Atlys board. The data sheet for the Marvell PHY is available from Marvell only with a valid NDA. Please contact Marvell for more PHY-specific information. EDK-based designs can access the PHY using either the xps_ethernetlite IP core for 10/100 Mbps designs, or the xps_ll_temac IP core for 10/100/1000 Mbps designs. The Atlys Base System Builder (BSB) support package automatically generates a test application for the Ethernet MAC; this can be used as a reference for creating custom designs. ISE designs can use the IP Core Generator wizard to create a tri-mode Ethernet MAC controller IP core. The Atlys board contains four HDMI ports, including two buffered HDMI input/output ports, one buffered HDMI output port, and one unbuffered port that can be input or output (generally used as an output port.) The three buffered ports use HDMI type A connectors, and the unbuffered port uses a type D connector loaded on the bottom side of the PCB immediately under the Pmod port (the type D port is much smaller than the type A). The data signals on the unbuffered port are shared with a Pmod port. This limits signal bandwidth somewhat – the shared connector may not be able to produce or receive the highest frequency video signals, particularly with longer HDMI cables. Since the HDMI and DVI systems use the same TMDS signaling standard, a simple adaptor (available at most electronics stores) can be used to drive a DVI connector from either of the HDMI output ports. The HDMI connector does not include VGA signals, so analog displays cannot be driven. The 19-pin HDMI connectors include four differential data channels, five GND connections, a one-wire Consumer Electronics Control (CEC) bus, a two-wire Display Data Channel (DDC) bus that is essentially an I2C bus, a Hot Plug Detect (HPD) signal, a 5V signal capable of delivering up to 50mA, and one reserved (RES) pin. Of these, only the differential data channels and I2C bus are connected to the FPGA. All signal connections are shown in the table below. EDK designs can use the xps_tft IP core (and its associated driver) to access the HDMI ports. The xps_tft core reads video data from the DDR2 memory, and sends it to the HDMI port for display on an external monitor. An EDK reference design available on the Digilent website (and included as a part of the User Demo) displays a gradient color bar on an HDMI-connected monitor. Another second EDK reference design inputs data from port J3 into onboard DDR2. Data is read from the DDR2 frame buffer and displayed on port J2. An xps_iic core is included to control the DDC on port J2 (this allows consumer devices to detect the Atlys). The Atlys board includes a National Semiconductor LM4550 AC ‘97 audio codec (IC3) with four 1/8” audio jacks for line-out (J5), headphone-out (J7), line-in (J4), and microphone-in (J6). Audio data at up to 18 bits and 48KHz sampling is supported, and the audio in (record) and audio out (playback) sampling rates can be different. The microphone jack is mono, all other jacks are stereo. The headphone jack is driven by the audio codec's internal 50mW amplifier. The table below summarizes the audio signals. The LM4550 audio codec is compliant to the AC ‘97 v2.1 (Intel) standard and is connected as a Primary Codec (ID1 = 0, ID0 = 0). The table below shows the AC ‘97 codec control and data signals. All signals are LVCMOS33. AUD-BIT-CLK L13 12.288MHZ serial clock output, driven at one-half the frequency of the 24.576MHz crystal input (XTL_IN). AUD-SDI T18 Serial Data In (to the FPGA) from the codec. SDI data consists of AC ’97 Link Input frames that contain both configuration and PCM audio data. SDI data is driven on the rising edge of AUD-BIT-CLK. AUD-SDO N16 Serial Data Out (to the codec) from the FPGA. SDO data consists of AC ’97 Link Output frames that contain both configuration and DAC audio data. SDO is sampled by the LM4550 on the falling edge of AUD-BIT-CLK. AUD-SYNC U17 AC Link frame marker and Warm Reset. SYNC (input to the codec) defines AC Link frame boundaries. Each frame lasts 256 periods of AUD-BIT-CLK. SYNC is normally a 48kHz positive pulse with a duty cycle of 6.25% (16/256). SYNC is sampled on the rising edge of AUD-BIT-CLK, and the codec takes the first positive sample of SYNC as defining the start of a new AC Link frame. If a subsequent SYNC pulse occurs within 255 AUD-BIT-CLK periods of the frame start it will be ignored. SYNC is also used as an active high input to perform an (asynchronous) Warm Reset. Warm Reset is used to clear a power- down state on the codec AC Link interface. AUD-RESET T17 Cold Reset. This active low signal causes a hardware reset which returns the control registers and all internal circuits to their default conditions. RESET must be used to initialize the LM4550 after Power On when the supplies have stabilized. RESET also clears the codec from both ATE and Vendor test modes. In addition, while active, it switches the PC_BEEP mono input directly to both channels of the LINE_OUT stereo output. The EDK reference design (available on the Digilent website) leverages our custom AC-97 pcore to accomplish several standard audio processing tasks such as recording and playing back audio data. The Atlys board includes a single 100MHz CMOS oscillator connected to pin L15 (L15 is a GCLK input in bank 1). The input clock can drive any or all of the four clock management tiles in the Spartan-6. Each tile includes two Digital Clock Managers (DCMs) and four Phase-Locked Loops (PLLs). DCMs provide the four phases of the input frequency (0º, 90º, 180º, and 270º), a divided clock that can be the input clock divided by any integer from 2 to 16 or 1.5, 2.5, 3.5… 7.5, and two antiphase clock outputs that can be multiplied by any integer from 2 to 32 and simultaneously divided by any integer from 1 to 32. PLLs use VCOs that can be programmed to generate frequencies in the 400MHz to 1080MHz range by setting three sets of programmable dividers during FPAG configuration. VCO outputs have eight equally-spaced outputs (0º, 45º, 90º, 135º, 180º, 225º, 270º, and 315º) that can be divided by any integer between 1 and 128. The Atlys includes an EXAR USB-UART bridge to allow PC applications to communicate with the board using a COM port. Free drivers allow COM-based (i.e., serial port) traffic on the PC to be seamlessly transferred to the Atlys board using the USB port at J17 marked UART. The EXAR part delivers the data to the Spartan-6 using a two-wire serial port with software flow control (XON/XOFF). Free Windows and Linux drivers can be downloaded from www.exar.com. Typing the EXAR part number “XR21V1410” into the search box will provide a link to the XR21V1410’s land page, where links for current drivers can be found. After the drivers are installed, I/O commands from the PC directed to the COM port will produce serial data traffic on the A16 and B16 FPGA pins. A Microchip PIC24FJ192 microcontroller provides the Atlys board with USB HID host capability. Firmware in the MCU microcontroller can drive a mouse or a keyboard attached to the type A USB connector at J13 labeled “Host”. Hub support is not currently available, so only a single mouse or a single keyboard can be used. The PIC24 drives four signals into the FPGA – two are used as a keyboard port following the keyboard PS/2 protocol, and two are used as a mouse port following the mouse PS/2 protocol. Two PIC24 I/O pins are also connected to the FPGA’s two-wire serial programming port, so the FPGA can be programmed from a file stored on a USB memory stick. To program the FPGA, attach a memory stick containing a single .bit programming file in the root directory, load JP11, and cycle board power. This will cause the PIC processor to program the FPGA, and any incorrect bit files will automatically be rejected. To access the USB host controller, EDK designs can use the standard PS/2 core. Reference designs posted on the Digilent website show an example for reading characters from a USB keyboard connected to the USB host interface. Mice and keyboards that use the PS/2 protocol use a two-wire serial bus (clock and data) to communicate with a host device. Both use 11-bit words that include a start, stop, and odd parity bit, but the data packets are organized differently, and the keyboard interface allows bi-directional data transfers (so the host device can illuminate state LEDs on the keyboard). Bus timings are shown in the figure. The clock and data signals are only driven when data transfers occur, and otherwise they are held in the idle state at logic ‘1’. The timings define signal requirements for mouse-to-host communications and bi-directional keyboard communications. A PS/2 interface circuit can be implemented in the FPGA to create a keyboard or mouse interface. The keyboard uses open-collector drivers so the keyboard, or an attached host device, can drive the two-wire bus (if the host device will not send data to the keyboard, then the host can use input-only ports). PS/2-style keyboards use scan codes to communicate key press data. Each key is assigned a code that is sent whenever the key is pressed. If the key is held down, the scan code will be sent repeatedly about once every 100ms. When a key is released, an F0 key-up code is sent, followed by the scan code of the released key. If a key can be shifted to produce a new character (like a capital letter), then a shift character is sent in addition to the scan code, and the host must determine which ASCII character to use. Some keys, called extended keys, send an E0 ahead of the scan code (and they may send more than one scan code). When an extended key is released, an E0 F0 key-up code is sent, followed by the scan code. Scan codes for most keys are shown in the figure. A host device can also send data to the keyboard. Below is a short list of some common commands a host might send. EE Echo (test). Keyboard returns EE after receiving EE. The keyboard can send data to the host only when both the data and clock lines are high (or idle). Since the host is the bus master, the keyboard must check to see whether the host is sending data before driving the bus. To facilitate this, the clock line is used as a “clear to send” signal. If the host pulls the clock line low, the keyboard must not send any data until the clock is released. The keyboard sends data to the host in 11-bit words that contain a ‘0’ start bit, followed by 8-bits of scan code (LSB first), followed by an odd parity bit and terminated with a ‘1’ stop bit. The keyboard generates 11 clock transitions (at 20 to 30KHz) when the data is sent, and data is valid on the falling edge of the clock. Scan codes for most PS/2 keys are shown in the figure below. The mouse outputs a clock and data signal when it is moved, otherwise, these signals remain at logic ‘1’. Each time the mouse is moved, three 11-bit words are sent from the mouse to the host device. Each of the 11-bit words contains a ‘0’ start bit, followed by 8 bits of data (LSB first), followed by an odd parity bit, and terminated with a ‘1’ stop bit. Thus, each data transmission contains 33 bits, where bits 0, 11, and 22 are ‘0’ start bits, and bits 11, 21, and 33 are ‘1’ stop bits. The three 8-bit data fields contain movement data as shown in the figure above. Data is valid at the falling edge of the clock, and the clock period is 20 to 30KHz. the mouse up generates a positive number in the Y field, and moving down represents a negative number (the XS and YS bits in the status byte are the sign bits – a ‘1’ indicates a negative number). The magnitude of the X and Y numbers represent the rate of mouse movement – the larger the number, the faster the mouse is moving (the XV and YV bits in the status byte are movement overflow indicators – a ‘1’ means overflow has occurred). If the mouse moves continuously, the 33-bit transmissions are repeated every 50ms or so. The L and R fields in the status byte indicate Left and Right button presses (a ‘1’ indicates the button is being pressed). The Atlys board includes six pushbuttons, eight slide switches, and eight LEDs for basic digital input and output. One pushbutton has a red plunger and is labeled “reset” on the PCB silkscreen – this button is no different than the other five, but it can be used as a reset input to processor systems. The buttons and slide switches are connected to the FPGA via series resistors to prevent damage from inadvertent short circuits. The high efficiency LED anodes are connected to the FPGA via 390-ohm resistors, and they will brightly illuminate with about 1mA of current when a logic high voltage is applied to their respective I/O pin. The Atlys board has a 68-pin VHDC connector for high-speed/parallel I/O, and an 8-pin Pmod port for lower speed and lower pin-count I/O. The VHDC connector includes 40 data signals (routed as 20 impedance-controlled matched pairs), 20 grounds (one per pair), and eight power signals. This connector, commonly used for SCSI-3 applications, can accommodate data rates of several hundred megahertz on every pin. Both board-to-board and board-to-cable mating connectors are available. Data sheets for the VHDC connector and for mating board and cable connectors can be found on the Digilent website, as well as on other vendor and distributor websites. Mating connectors and cables of various lengths are also available from Digilent and from distributors. All FPGA pins routed to the VHDC connector are located in FPGA I/O bank 2. The bank 2 I/O power supply pins and the VHDC connector's four Vcc pins are connected to an exclusive sub-plane in the PCB, and this sub-plane can be connected to 2.5V or 3.3V, depending on the position of jumper JP12. This arrangement allows peripheral boards and the FPGA to share the same Vcc and signaling voltage across the connector, whether it be 3.3V or 2.5V. The unregulated board voltage Vswt (nominally 5V) is also routed to four other VHDC pins, supplying up to 1A of additional current to peripheral boards. All I/O’s to the VHDC connector are routed as matched pairs to support LVDS signaling, commonly powered at 2.5V. The connector uses a symmetrical pinout (as reflected around the connector's vertical axis) so that peripheral boards as well as other system boards can be connected. Connector pins 15 and 49 are routed to FPGA clock input pins. The Pmod port is a 2×6 right-angle, 100-mil female connector that mates with standard 2×6 pin headers available from a variety of catalog distributors. The 12-pin Pmod port provides two VCC signals (pins 6 and 12), two Ground signals (pins 5 and 11), and eight logic signals. VCC and Ground pins can deliver up to 1A of current. Jumper JP12 selects the Pmod Vcc voltage (3.3V or 2.5V) in addition to selecting the VHDC voltage. Pmod data signals are not matched pairs, and they are routed using best-available tracks without impedance control or delay matching. On the Atlys board, the eight Pmod signals are shared with eight data signals routed to an HDMI type D connector. The HDMI connector, located immediately beneath the Pmod port on the reverse side of the board, includes an I2C bus and conforms to the HDMI type D pinout specification, so it can be used as a secondary HDMI output port. A type D to type A HDMI cable may be required, and is available from Digilent and a variety of suppliers. Digilent produces a large collection of Pmod accessory boards that can attach to the Pmod and VHDC expansion ports to add ready-made functions like A/D’s, D/A’s, motor drivers, sensors, cameras and other functions. See www.digilentinc.com for more information. A demonstration configuration is loaded into the SPI Flash ROM on the Atlys board during manufacturing. This demo, also available on the Digilent website, can serve as a board verification test since it interacts with all devices and ports on the board. When Atlys powers up, if the demonstration image is present in the SPI Flash, the DDR is tested, and then a bitmap image file will be transferred from the SPI Flash into DDR2. This image will be driven out the HDMI J2 port for display on a DVI/HDMI-compatible monitor. The slide switches are connected to the user LEDs. The user buttons BTNU, BTND, BTNR, BTNL, BTNC, and RESET cause varying sine-wave frequencies to be driven on the LINE OUT and HP OUT audio ports. If the self test is not resident in the SPI Flash ROM, it can be programmed into the FPGA or reloaded into the ROM using the Adept programming software. All Atlys boards are 100% tested during the manufacturing process. If any device on the Atlys board fails test or is not responding properly, it is likely that damage occurred during transport or during use. Typical damage includes stressed solder joints and contaminants in switches and buttons resulting in intermittent failures. Stressed solder joints can be repaired by reheating and reflowing solder and contaminants can be cleaned with off-the-shelf electronics cleaning products. This zip file contains an EDK demo project that illustrates how to use the AC97 codec on the Atlys board with Microblaze. This zip file contains an EDK demo project that demonstrates using HDMI on the Atlys board. It accepts an HDMI input, buffers the input frames into memory, and then outputs the buffer to another HDMI port. This is implemented using PLB bus. Download This zip file contains an ISE demo project that demonstrates the use of general I/O and UART on the Atlys board in VHDL. This zip file contains an EDK demo project that illustrates how to host a web server on the Atlys. It was built using EDK 14.3. Built binary image for Atlys_Demo_BIST. This can be used to restore the original factory image in the Atlys SPI Flash. To reprogram, use the Flash tab in the Adept Application.